Join us for a screening of PBS Documentary American Creed followed by guided discussions and writing responses facilitated by Sarah Kreps, Associate Professor of Government at Cornell University, David Franke, Professor of English at SUNY Cortland and Director of the Seven Valleys Writing Project, NWP, and Debbie Stack, Education and Outreach Coordinator for WCNY. These events will take place at 7pm at Southworth Library Association. There will be a writing contest on April 25 at 7pm. For more information on the prompt and submission instructions click here. Two winners will be chosen in each of three categories: 10 – 16, 17 – 25 and over 25 for $50 prizes. Any other questions can be directed by email to director@southworthlibrary.org or call 607-844-4782. The Lucius Beebe Memorial Library is hosting three public screenings of American Creed followed by scholar facilitated discussions. Chesterfield County Public Library is hosting a screening of American Creed on April 20, 2019 at 10:30 AM. There will be a discussion on the importance of civil dialogue facilitated by Dr. Sylvia Gale, director of the Bonner Center for Civic Engagement at the University of Richmond, on April 27, 2019 at 10:30 AM to 12 PM. Joan Blades, a co-founder of MoveOn and Mark Meckler co-founder of the Tea Party Patriots will discuss how they used civic dialogue and active listening to get a better understanding of each others organizational missions and beliefs. 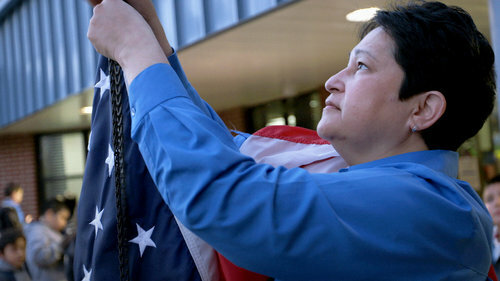 Blair County Library System, in partnership with area libraries and Penn State Altoona, is hosting community conversations drawing upon themes of the documentary American Creed. This event is designed to bring individuals from diverse communities together to discuss local issues and how they affect our shared sense of American Identity. Conversations after the film will be facilitated by Dr. William J. White of Penn State Altoona. The event will be held on Thursday, April 25th at 6pm. The Middletown Free Library in partnership with Neumann University is hosting an American Creed Memoir Writing Workshop with Dr. Mary Beth Yount. You will learn the “how-to” of memoir writing from an experienced author and get started with practical exercises. Writing Your Story Workshop will allow you to shape your past, connect with future generations, or simply keep your wits sharp. The event will take place Thursday, April 25th at 6:30pm. Join us for a 3 part screening of American Creed a PBS documentary that invites audiences to consider what America’s ideals and identity ought to be. The first discussion will be led by Dr. Stephen Berrey from the University of Michigan on March 13th from 1pm- 4pm in the Waldorf/Dunning Room. The second discussion will be on April 25, 2019 at 6pm- 8:45pm in the Waldorf/Dunning Room. The third discussion will be on May 11, 2019 at 1pm- 4pm in the Waldorf/Dunning Room. Join Woodford County Library for a community conversation focused around the documentary American Creed. This will be followed by discussion moderated by Lori Garkovich from the University of Kentucky and Rick Schein. The event will be on Monday, April 28th from 1:00 pm - 3:00 pm. Please call (859) 873-5191 to sign up for this free program. Join us for a Writing Celebration! After viewing excerpts from American Creed, we will celebrate outstanding youth and adult writing sparked by the film with a panel facilitated by Mary Sawyer, SUNY New Paltz, Jacqueline Hesse, Newburgh Free Academy, and P-TECH. The American Creed Writing Celebration is accepting submissions until March 22, 2019. This event is part of a five-program series running from March 2nd until August 17th. Learn more about the series here! American Creed is screening at the North Regional Branch of Cumberland County Public Library. The screening and followed discussion will be on Sunday, May 05, 2019 from 2pm to 5pm. There will be a panel discussion and a series of book discussions to explore what unites us as Americans that will follow. For more information click here. At a time when our country may feel divided, what are the hopes and beliefs that unite us as Americans? Join Carmel Clay Public Library for a series of discussions designed to engage the community in thoughtful and respectful dialogue. The series will explore themes from American Creed, a PBS documentary. Presented in partnership with the IUPUI Arts and Humanities Institute. This events will be held on Thursday, May 2, 16, & 23 from 6:30 pm - 8:30 pm in the Program Room. Join us for a special screening of American Creed at the Jewish Community Center East Bay in Berkeley followed by a post-screening discussion by Joan Blades, founder MoveOn and Living Room Conversations. Join The Middletown Free Library in partnership with Neumann University for a two hour workshop that will help patrons to begin writing their family history. It will help them to illustrate where their family fits in to local, national, and world history. They will discover that everyone is a storyteller and that we each have our own response to a situation or circumstance. Laura Kuchmay will be presenting on Tuesday, May 7th at 6:30pm. The event will be held on Thursday, May 9th at 6pm. Join Hewlett-Woodmere Library in a screening and discussion of American Creed. Professor James Coll will facilitate the discussion. The event will occur on Friday, May 17th, 2019 from 10:30am- 12:00pm in the Boehm Meeting Room. Join us for a documentary film screening American Creed and discussion on Saturday, May 18, 2019 from 2:00pm - 4:00pm. Discussion to follow with Dr. Donald Greenberg of Fairfield University. Can a divided America find common ground? Join us for a screening and discussion of the PBS documentary American Creed that seeks to discover what unites us as Americans from 6pm to 8:30pm. Join us for a screening and discussion of the PBS Documentary American Creed where former US Secretary of State Condoleeza Rice and Pulitzer Prize-winning historian David M. Kennedy come from different perspectives to investigate the idea of a unifying American creed. Their inquiry frames the stories of citizen-activists striving to realize their visions of America's promise across deepening divides. The event will take place on Thursday May 30th from 6:30pm to 9:00pm. The Nyack Library will host a film festival where we will showcase the films entered into the American Creed Community Conversations Program Series Film Festival. Each entered film should between 2-5 minutes long and has to respond to the question: How we can make a difference in our immediate community? Submissions start January 18, 2019 and will be broken up into two categories: youth and adults. Join St. Louis County Library in a community conversation about the PBS Documentary American Creed. Moderated by Dr. John Inazu of Washington University. Events are from 6:30pm -8:00pm. Join us for a special screening of American Creed followed by a discussion moderated by Peabody Award winning journalist Ron Steinman. Inspired by the PBS documentary American Creed, this writing contest and presentation asks young writers to examine the question, “Who gets to be counted as ‘American’ and why?” The contest is open to students at Pawling High School as well as homeschooled students. Readings, discussion and awards will take place at the Holmes Whaley Lake Civic Association on April 27, 2:00pm to 5:00 pm. Join us for Civic Saturday where we gather to discuss the moral question of what it means to be an American. The event is hosted by Felix Endara, a civic seminarian from Citizen University. The discussion will be held at the Community/Meeting Room from 12pm- 2pm. The Butte County Library screened American Creed and hosted a four-part community conversation! Facilitators were : Dr. Patrick Newell, Dean of the Library, Dr. Susan Roll, Director of Civic Engagement, Dr. Kate McCarthy, Interim Dean of Undergraduate Education, Dr. Kim Jaxon, Associate Professor of English & Director of the Northern California Writing Project and Matt Thomas, Professor of Political Science (on various nights). The events took place on the Chico State campus and the Chico and Oroville Library in the evening. Nevada County Public Library invited the community to come out for a screening and discussion of PBS Documentary American Creed. Lori Burkhart-Frank lead a guided discussion on connection and relationship in the community, and related it to a short reading or poem. The event took place on Thursday, April 18, 2019 at 6pm to 7pm. This is part of a four part series, for more information click here. Central Library of Rochester & Monroe County had a two-part discussion of PBS documentary American Creed. Part one of the Community Conversation was a viewing and discussion facilitated by Beth Adams of WXXI. This event was on Saturday, April 13th from 1:00 pm - 3:00 pm in the Kate Gleason Auditorium. Part two of the Community Conversation was facilitated by Dr. Timothy Kneeland, chair of the history department at Nazareth College on Wednesday, April 18th at 7pm in the Kate Gleason Auditorium. A panel discussed the themes presented in the film. Kent Gardner - The Rochester Beacon. Wilmette Public Library is hosting a screening of American Creed followed by a conversation facilitated by Debra Gurvitz and Deborah Shefren from the National Writing Project. This event is part of a six-program series running from through April 30th. Learn more about the series here! Wheaton Public Library invited their community to join an American Creed film screening and discussion led by Dr. Caroline Kisiel of DePaul University. The event took place at 6:30 pm in Meeting Room A. The following week there was a deeper discussion into the themes of the PBS documentary American Creed. Dr. Caroline Kisiel of DePaul University asked these questions: Who gets to be counted as "American" and why? How can we make a difference to our immediate community? The event took place on April 15th at 7 pm in Meeting Room A. Union Public Library hosted a conversation about American identity and a special screening of American Creed followed by a discussion moderated by John Daquino (Union Public Library), Bridget Lepore & Voices of Kean (Kean University), and Kean University Writing Project. Middletown Free Library hosted a screening of PBS Documentary American Creed followed by a conversation facilitated by Dr. Mary Beth Yount of Neumann University. The event was from 6:30pm- 8:45pm. There will also be several writing workshops in May. The Memoir Writing Workshop with Dr. Mary Beth Yount will be on April 25 at 6:30pm. American Creed Family History Writing Workshop with Laura Kuchmay, the adult services librarian, will be on May 7 at 6:30pm. There is also an American Creed Book Discussion of "The Common Good" by Robert B. Reich on May 14 at 6:30pm. Liverpool Public Library and the Liverpool Village hosted Historian, Dorianne Gutierrez, for stories of settler groups immigrating to Liverpool. The event also featured Daryl Files of the Interfaith Works of CNY, who will discuss current immigration in Syracuse as well as the process of immigrating to the United States. They met in the Fay Golden Reading Room from 6:30pm- 8:30pm. Poughkeepsie Library invited their community to join them on April 10th from 6:30pm-8:30pm for a screening of American Creed followed by a bold conversation about what it will take to uphold American democracy. This event was facilitated by Dr. Matthew Murray of Dutchess Community College. It was the first in a series of public programs follow by The American creed, Identity and Social Change, a talk presented by Dr. Lynn Mills Eckert of Marist College about the application of American ideals and identity in today’s social landscape. Wednesday April 17, 2019 from 6:30pm-8:30pm. In collaboration Southwest Minnesota State University and Pioneer Public Television, and with the support of a grant from the American Library Association, both SMSU and the Marshall-Lyon County Library hosted a lecture and discussion series based around the PBS program American Creed. Crossing party lines and spanning across the US, American Creed asks: what does it mean to be an American? The third event in this series will focused on the topic of civic engagement. What is civic engagement? How can communities and individuals make a difference by focusing on our similarities? Staff from SMSU’s office of Diversity and Inclusion moderated. This event was held at the Marshall-Lyon County Library from 6:30pm to 9:30pm and was also held at earlier in the day at noon in Charter Hall room 201 on SMSU’s campus. Cherry Hill Public Library hosted a screening and discussion of American Creed. After the screening, Dr. Christopher Fisher, Associate Professor of History at The College of New Jersey, lead a discussion that explored questions and themes raised in the documentary such as, "Who gets to be counted as "American" and why?" The event will took place on Monday, April 8th from 7:00 pm - 9:00pm in the Conference Center Lower Level. Blair County Library System, in partnership with area libraries and Penn State Altoona, hosted a community conversation drawing upon themes of the PBS documentary American Creed. Facilitated by Dr. William J. White of Penn State Altoona, this events was designed to bring individuals from diverse communities together to discuss local issues and how they affect our shared sense of American Identity through conversations and a partial screening of the film. The event was on Thursday, April 4th from 6pm to 7pm. The Alvin Sherman Library hosted a discussion of PBS Documentary American Creed. A program developed by the Nova Southeastern University Inclusion and Diversity Council. Presenters included Dr. Robin Cooper, Special Assistant to the Dean and Associate Professor of Conflict Resolution and Ethnic Studies in the NSU College of Arts, Humanities, and Social Sciences. Wright Memorial Library hosted a screening and discussion of American Creed on March 30th at 1:00pm to 3:30pm. Steven Conn, Miami University W. E. Smith Professor of History, facilitated the conversation. Themes included: Who is American? How are American ideals shaped by different experiences? How can we make a difference in our communities? Wright Library is partnered with Think TV to bring American Creed conversations to Oakwood and surrounding communities. Barrington Public Library hosted a screening of American Creed, followed by a Community Conversation facilitated by Prof. Aaron C. Allen of the American Studies Department at Roger Williams University. Event took place from 6:30pm-9:00pm. American Creed screened at Scranton Public Library followed by a Q&A discussion led by Historian Dr. Adam Pratt from The University of Scranton. The screening was hosted in the Henkelman Room, 2nd floor of the library from 6:30-8:00pm. 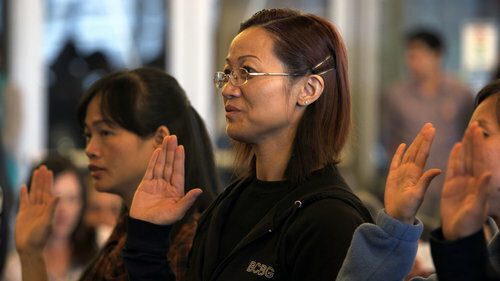 Adjusting to America: Who gets to be counted as "American" and why? How significant is the process of "Americanization" over generations? The event took place in the Androscoggin Community Room at 5:30pm- 6:30pm. Where Does a Nation’s Identity Come From? A screening of American Creed was hosted by Aurora Free Library on March 27th at 7:00pm. The screening was followed by a Community Conversation facilitated by Professor Michael Groth of Wells College on Equality of Opportunity: What it Meant in the Past and What it Means Now. American Creed screened in Nyack! Mayor Hammond spoke about how to get involved in the Nyack Community. The Nyack Community Chorus*, under the direction of Dru Pluhowski, aims to create music that “fosters community, stirs the soul, and ignites joy for all.” The Chorus sang from their Winter Concert among these “Make Them Hear You”& “Give Me Your Tired Your Poor” to complement American Creed’s Conversation with Nyack’s Mayor Don Hammond. The screening was from 7pm- 8pm in the community meeting room. A lecture and discussion took place at the Marshall-Lyon County Library that was based around American Creed, a PBS documentary. The event is from 6:30pm- 8pm and focused on the farming and agriculture business, which affects civic relations from generations of family farmers to the immigrant workers who process turkeys and pick rocks. The discussion will included local speakers and was moderated by Cassie Williams of Southwest Minnesota State University’s (SMSU) Office of Diversity and Inclusion (ODI). This event was also held earlier in the day at noon in Charter Hall room 201 on Southwest Minnesota State Universities campus. Both events were free and open to the public. American Creed, a PBS documentary that invites audiences to consider what America’s ideals and identity ought to be, screened on March 26th. The film showing was followed by a discussion with Timothy Dixon, J.D., Associate Professor, NSU College of Arts, Humanities and Social Sciences, Department of History and Political Science. PBS Documentary American Creed screened at Dobbs Ferry Public Library on March 24th. A Community Conversation about "What Makes Us Americans" was moderated by Jami Floyd, WNYC local host of All Things Considered. What role does education and economic opportunity play in your "American Dream?" Troy Public Library hosted a viewing and discussion of American Creed on March 24th at 1:30pm. Facilitated by Professor Jennifer Thompson Burns, PhD Candidate in Philosophy – United States History with a concentration in 19th century US Social History. Baldwinsville Public Library hosted a screening and discussion of PBS Documentary American Creed facilitated by Tom Henry at 6:30pm. To see other community conversation events hosted by Liverpool Public Library’s Community Conversations click here. A screening of American Creed hosted by the Wilmette Public Library took place on March 9th at 2pm. This was part of a six-program series running from through April 30th. Learn more about the series here! Ferguson Library hosted a screening and discussion of American Creed on March 20th from 6pm- 8 pm. Dr. Bryan Ripley Crandall, Associate Professor of Literacy and Director of the Connecticut Writing Project at Fairfield University. Dave Wooley, Connecticut Writing Project Teacher-Leader and English educator at Westhill High School teaches AP Language and Composition, Literacy Lab, and Beats, Rhymes and Life: Diverse Perspectives in Literature. American Creed, a PBS documentary that invites audiences to consider what America’s ideals and identity ought to be screened at Lopez Island Library. The film showing was followed by a discussion led by Timothy Dixon, J.D., Associate Professor, NSU College of Arts, Humanities and Social Sciences, Department of History and Political Science. American Creed screened at the Auburn Public Library’s Androscoggin Community Room at 6pm. The screening was followed by a scholar facilitated discussion. More information about Auburn Public Library events schedule can be found here! In collaboration Southwest Minnesota State University and Pioneer Public Television, and with the support of a grant from the American Library Association, both SMSU and the Marshall-Lyon County Library hosted a lecture and discussion series based around American Creed. The first event in this series involved a showing of American Creed and a guided discussion. This event also was repeated earlier in the day in Charter Hall room 201 on SMSU’s campus. Both events were free and open to the public. A map of SMSU’s facility can be found here: http://www.smsu.edu/map/index.html. This event will be followed by a moderated discussion about local Agriculture Economy on March 26th, and another about Civic Engagement on April 9th. This event was originally scheduled for Thursday, January 24th, but was postponed twice due to weather. Downers Grove Library screened the film American Creed and had a discussion on the ideas in the film, facilitated by DePaul Professor Caroline Kisiel. American Creed screened at 2pm at the Suffield Senior Center followed by a conversation facilitated by Lucy Nalpathanchil, host of Where We Live on WNPR. The series continued on Tuesday, February 19 at 7pm at the Suffield Senior Center. Jonathan M. Beagle, an Associate Professor of History at Western New England University will present a talk on “The Seeds of the American Creed”. Mr. Beagle’s emphasized on how our identities and ideals were formed in early American history. Other speakers in the series were Douglas L. Battema, Professor and Chair of the Department of Communication; William Force, Associate Professor of Sociology; and Winthrop Rhodes, Professor of English. All teach at Western New England University. American Creed screened at the Skirball Cultural Center in Los Angeles on Sunday, December 9th. The film was followed by a discussion facilitated by Liz Vogel from Facing History and Ourselves with director Sam Ball and film participants Tegan Griffith and Terrence Davenport. The event was copresented by Citizen Film, PBS SoCal, and the Skirball. East Lansing Public Libraries and the Red Cedar Writing Project at Michigan State University hosted a screening of American Creed followed by a scholar facilitated discussion on September 20th, 2018. Singer David Roth was the lead-in performance from 6-6:30 p.m. More information about the event can be found here. An audience of University of Missouri students participated in a screening of American Creed followed by a scholar facilitated discussion in a program hosted by The Bridge, a “brave space” for the campus community to expand their multicultural knowledge, awareness, and skills. Newsroom By The Bay, a journalism and digital literacy summer training program for youth, invited American Creed director Sam Ball to keynote their summer 2018 session. Ball screened American Creed and facilitated a discussion about the film, and how journalists might create work that fosters conversation supporting shared investment in American democracy. On July 4th students participated in a day long reporting challenge interviewing people to ask American Creed’s central question, “What does it mean to be American?” You can view the results of the challenge as well as the students’ live tweets of Sam Ball’s visit on Twitter here. Jefferson City Commission on Human Relations and the Missouri Writing Project hosted a screening of American Creed. Following the film participants were invited to engage in a community conversation about topics raised in the film. Entrepreneur Terrence Davenport and Marine Corps veteran Tegan Griffith, both featured in American Creed, engaged Facing History students in a dialogue about freedom, fairness, opportunity, and the meaning of citizenship after screening a selection of clips from the film. Arizona PBS and the Virginia G. Piper Charitable Trust hosted a screening of excerpts from American Creed and a panel discussion. Facing History and Ourselves and WGBH hosted a special screening of American Creed followed by a conversation featuring director Sam Ball, and cast member Terrence Davenport. The public was invited to attend a screening of American Creed. Following the screening, the director of Penn State Lehigh Valley Writing Project, Nicole Moschberger, lead an open-forum discussion for those in attendance. The public was invited to attend an American Creed screening and participate in a community conversation led by cast member Terrence Davenport. Watch the American Creed PBS SPECIAL 2/27 at 9pm Eastern and Pacific Times (8pm Central and Mountain). The people of Wittenberg joined WBHS alumnus Tegan Griffith, featured in the film American Creed, for an evening of shared purpose, values, and experiences that hold us together as Americans. The film screening was followed by a town hall discussion moderated by Tegan. U.S. Marine/Iraq and Afghanistan Veterans of America Leader Tegan Griffith and social entrepreneur Terrence Davenport joined an audience in Pensacola for an American Creed screening and Q&A. WSRE is one of ten public television stations selected for hosting community events in conjunction with the national premiere of the film. The public was invited to attend screenings of American Creed and experience local stories about citizenship and community building. Learn more at wsre.org/events/americancreed. UW-Stevens Point senior Tegan Griffith, featured in the film American Creed, joined an audience in Stevens Point for an evening of shared purpose, values, and experiences that hold us together as Americans. The film screening was followed by a town hall discussion moderated by Tegan and directed by the viewers. Joe Maddon returned to his hometown of Hazleton, PA for a special sneak preview of American Creed. Despite cold winter weather, over 150 enthusiastic fans attended. Said Maddon: "Being an American is about coming together and trusting one another and trying to do what's best for everybody, and not just for certain groups." To find more American Creed events in Pennsylvania, visit wvia.org/american-creed. © 2017 Citizen Film. All Rights Reserved.